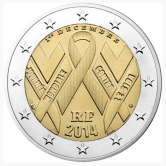 This coin commemorates “World Aids Day” which is an annual event organized by UNAIDS, the United Nations AIDS organization. The central motif is the internationally recognized symbol for the fight against aids, a red ribbon in the form of an inverted “V”. On the day that aids is finally conquered, the symbol will be inverted, representing then a “V” for victory. On the left and right of the main motif are two further ribbons which rather than looping, support a “V” – presumably representing the anticipated victory. On the edge of the inner circle from eleven to one o’clock is the inscription “1st December”. At the bottom is the country designation “RF” and thereunder the year of issue 2014. The mint mark and mark of the mint master appear at eight and four o’clock respectively.